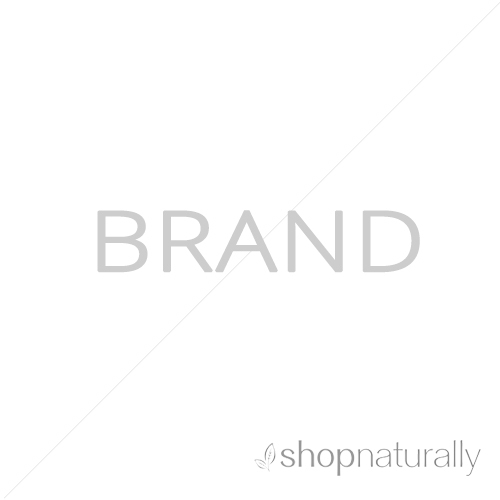 A natural formula using Chinese Herbal Medicine to treat acne internally. 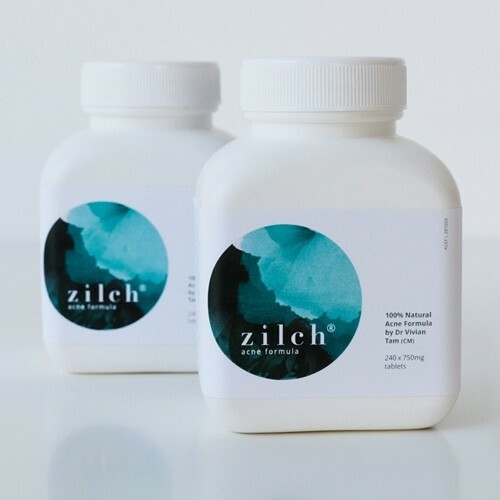 Zilch Acne Formula is the creation of Dr Vivian Tam, a Doctor in Chinese Herbal Medicine. 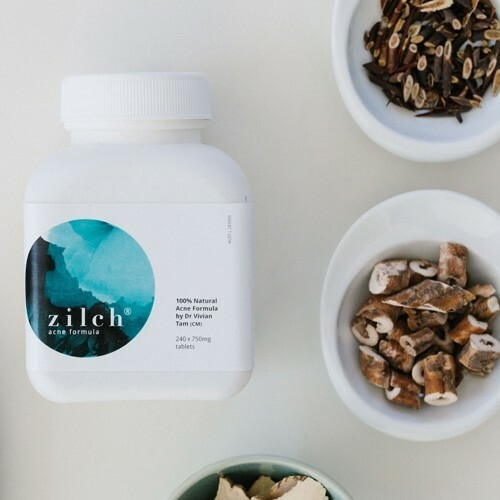 Zilch is formulated with 17 potent Chinese herbs to heal the skin from the inside out. There are no harsh chemicals or overly drying topical applications to dry up the skin, it's an internal supplments approved by the TGA and manufacturered under strict TGA standards. Zilch Acne Formula works by reducing inflammation in the body that causes skin to swell, itch and be red. It removes heat and toxicity (in Chinese medicine terms) that cau cause skin breakouts. 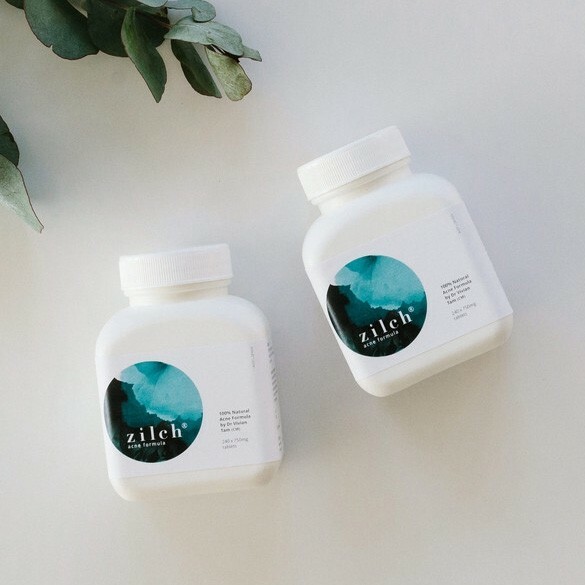 It assists in detoxing the body by supporting the liver and the digestive system so there's less build up in the body that wants to escape through the skin. It assists in promoting good blood circulation which can stop deeper nodules in the skin. In clinical trials with 250 patients, 90% showed improvement. Patients report changes wtihin 1-2 weeks as inflammation reduces. Clear skin may result from 6 to 8 weeks, but each person is different and a long term treatment plan is advised. DOSE - for Severe Acne take 4 tablets in the morning and 4 in the evening. Reduce for milder acne or for a maintenance dose. There are 240 tablets per bottle. WARNINGS - Zilch should not be used during pregnancy. Zilch should not be used for people taking anticoagulant drugs or people at risk of bleeded. Please consult a medical professional with questions before starting your treatment. Prunus persica, Carthamus tinctorius, Salvia miltiorrhiza, Hedyotis diffusa, Herba, Angelica dahurica, Gleditsia sinensis, Spina, Viola yedoensis, Herba, Taraxacum mongolicum, Herba, Lonicera japonica, Phellodendron amurense, Paeonia suffruticosa, Gardenia florida, Gentiana scabra, Scutellaria baicalensis, Zingiber officinale, Angelica polymorpha, Glycyrrhiza uralensis, Starch-Potato.